As a follow-up of the Arbovirus diagnostic workshop and in response to the Zika outbreak in 2015, the human virology working group has distributed real-time RT-PCR reagents to all laboratories of the Human Virology network in order to enhance the diagnostic capacity for arboviral infections, in particular, West Nile, Chikungunya, Rift Valley fever and Zika. January 2016: Mrs. Zuleyha Ergun from the Veterinary Faculty of Ankara (PhD student of Dr. Ozkul) was trained during one month at CISA-INIA about molecular diagnosis of WNV and related flaviviruses and biosafety practices. 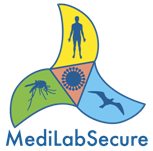 The collaboration was stablished under the MediLabSecure project and the internship at CISA-INIA was financed by the Turkish Government. February 2016: Dr. Nabil Abouchaib (ONSSA, Morocco), visited CISA-INIA for 3 days and performed the required analysis to fully characterize an avian influenza isolate from an outbreak in Morocco.